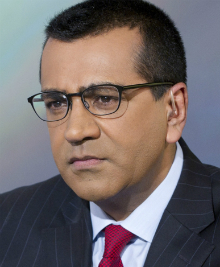 Martin Bashir is an awarding-winning broadcast journalist who, from 2010 to 2013, hosted his own daily news show on MSNBC, based in New York. He joined MSNBC after spending five years anchoring Nightline on ABC News, providing in-depth journalism on the major news stories from around the world. Martin is best known for conducting a series of exclusive, high profile interviews and landmark documentaries on subjects as wide-ranging as the Princess of Wales, to Michael Jackson, to exclusively exposing the BALCO scandal. In addition to breaking internationally-impactful stories he also anchored major events, from the Olympic Games to the Royal Wedding of Prince William to Kate Middleton. Through his determined pursuit of high quality journalism, he has been able to maintain a record of ratings success – from his achievements at the BBC and ITV to helping take Nightline on ABC from third place to first, and raising the status of NBC’s cable news network from fourth to second and occasionally first. He has lectured at several schools and colleges, and has chaired public debates at Columbia University on the philosophy of religion and the challenge of the so-called New Atheists. Book Martin Bashir as a keynote speaker. "A sharp and thoughtful commentator on current affairs, Martin is responsible for delivering some of the most memorable high impact stories to a worldwide audience. His signature reporting has delivered outstanding ratings and garnered celebrated awards from around the world. "